Stones Throw celebrates its tenth anniversary with an appropriate Best Of, collecting some of their best records of the last decade all on one disc. 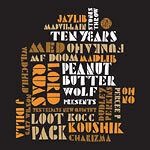 Songs from Jaylib, Dudley, Peanut Butter Wolf, Homeliss Derilex, Funkaho, YNQ and the rest of the gang. J Rocc mixes them up on the second disc to a lovely combination.